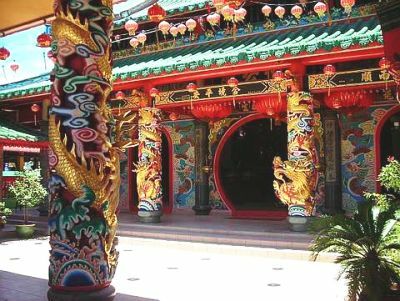 THE Tua Pek Kong Temple in Miri has survived two world wars. It is almost 100 years old, and like a grand old man, has played a part in shaping Miri into what it is today. The temple is a piece of history by itself. Attractive: The temple has intricate designs on its pillars and other structures. Over the past century, it had been a centre for major festivals and religious rituals celebrated and performed by the Chinese community. According to local beliefs, due to the oil boom of the early 1900s and its subsequent population explosion, an unknown epidemic struck Miri, resulting in a high death toll in what was then a small village. The local Chinese of that time believed the tragedy was caused by evil spirits. A Chinese wise man known as Chan Chak suggested that a monk be called to appease the spirits. Thus, a spirit-pacifying ritual was carried out near Miri River, where an altar was placed. The Chinese residents believed the monk chased away the evil spirits and the epidemic subsided. In gratitude, they erected the temple near the river to revere Tua Pek Kong, a god commonly worshipped by Chinese immigrants. During WWII, the temple was the only building in the town which survived the Japanese bombings. 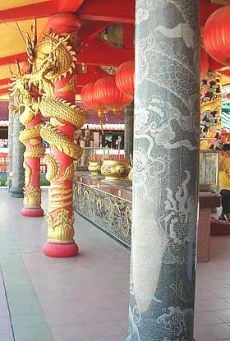 Today, Tua Pek Kong is still a god commonly worshipped by Chinese residents in Miri and the temple has become an important landmark for tourists. Located near Central Fish Market in the heart of old Miri, the temple was renovated in 1977. Everyday, come rain or shine, a healthy old man sits at a corner of the temple. He is a respected leader who had been managing the temple since his appointment to the job in 1983. Interesting: The temple’s architecture and design is similar to temples in mainland China. Kapitan Khoo Choo Ken, 82, had been making decisions in regard to the rituals and ceremonies at the temple. 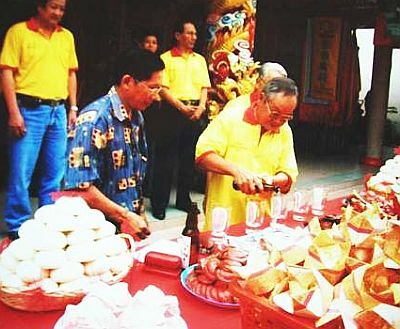 He leads at all major rituals including those held during Chinese New Year’s eve, Chap Goh Mei (the last day of Chinese New Year festivities), worship of the tiger or Hu Ye, Hungry Ghost Festival and Lantern Festival. Every year on the 29th day of the third lunar month, the Chinese celebrate the birthday of Tua Pek Kong with interesting stage shows. The deities are also paraded on the streets to protect and give blessings to the worshippers. On the first and 15th day of every lunar month, devotees worship the deities at the temple with offerings and prayers for protection and good fortune. Dutiful: Khoo pouring wine into a glass during a ceremony at the Tua Pek Kong Temple in Miri. The temple provides free vegetarian meals to devotees and visitors on these days. Rice donated by the devotees is given to the poor. According to the temple’s caretaker, who wanted to be known only as Madam Lim, an interesting phenomenon is seen at the temple. Whenever the temple needs a donation for a particular purpose, many devotees willingly come forward without hesitation. “When it comes to worship or giving donations, there is no difference between young and old. In my 20 years here, I have seen that the worship of the gods is not only done by the Chinese. There are people of other races who seek the help of Zhu Sheng Niang Niang, a goddess who blesses children. Thus, the temple is not a place only for the Chinese,’’ she said. Every part of the temple was built through donations from the community and the names of the donors are displayed in recognition of their contributions.